We the membet of Ananda Asram Welfare Trust working for the underprivileged children of Kolkata for their education and providing them stationery kits and many more. For the last one year we have done more than 12 project in Kolkata(india) and howrah (india) also. 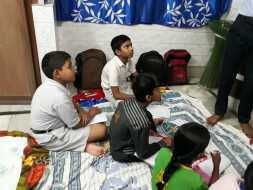 Now from 2018 we have started giving free classes of computer education,english and drawing to 10 underprivileged children.But right now we have dont have so much of fund to buy a computer ,stationery kits,shoe,dress ,chair , table for the street school.On 29th of april we going to organise a drawing competition in a orphanage home in which we will donate stationery kits ,food packets and many more. At the same time we need to continue the free classes of computer education for the unprivileged children for that reason we neef fund .Please suppourt us and donate something for this cause.